J – So, it’s been a while. Life got in the way, moves occurred, and cooking still happened – but pictures and posts got left behind. But, after a 15 month hiatus, we’re back! And just in time for a July 4th meat-filled freedom weekend. We’ll have a few posts this weekend – including our first attempt at grinding our own hamburger meat (hint: it involves bacon and pork fat) and four new summer beers. Without further ado, I wanted to jump right in and tell you all about what I’ve got in the fridge for tomorrow – about 7 pounds of beef. Growing up in Texas I always loved brisket, but I’ve never had a big enough oven (or access to a smoker/grill) to make it myself. This year, Ines & I are celebrating our combination birthdays and July 4th this weekend with heaps of meat, and I figured it was about time I tackled brisket on my own. We popped by Central Meat Market in Providence this afternoon to check them out – it’s a great butcher that carries lots of Spanish/Portuguese cuts, which is nice (I’m especially excited about their bacon and pork belly slabs…that might be my next meat project). They cut us some brisket on the spot – not quite the way I would have liked it cut, but I didn’t specify I wanted it flat and untrimmed, so that’s really on me. Still, we walked out with a 7 pound brisket cut with plenty of fat for my taste for about $30, which really ain’t that bad. 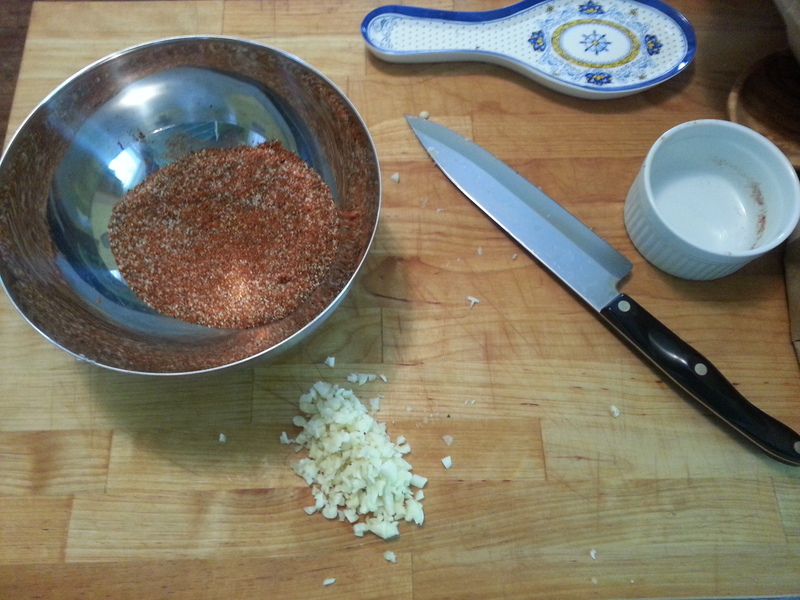 I made up a simple rub – equal parts salt and black pepper and 1/3 parts each cayenne pepper, paprika, and cumin, and then 6 cloves minced fresh garlic (see recipe for exact amounts). This rub is a bit like a chili spice, but much, much saltier so the meat will cure. If you like it spicier, take out the paprika or cumin and add in the same amount cayenne. The now-rubbed brisket is sitting in the fridge on a rack curing overnight, and tomorrow it’s going in the oven for…well, the better part of the day at 250F with some onions, Worcestershire sauce, coffee, apple cider vinegar, and a cup of homebrew to keep things moist. I can’t wait to see how this one turns out…we’ll check back in tomorrow with the results! In a bowl, whisk together 3 tbsp salt, 3 tbsp ground black pepper, 1 tbsp cumin, 1 tbsp paprika, and 1 tbsp cayenne pepper. Mince 6 cloves garlic. Sprinkle the rub and garlic on all sides of the brisket, with most on the meat side. 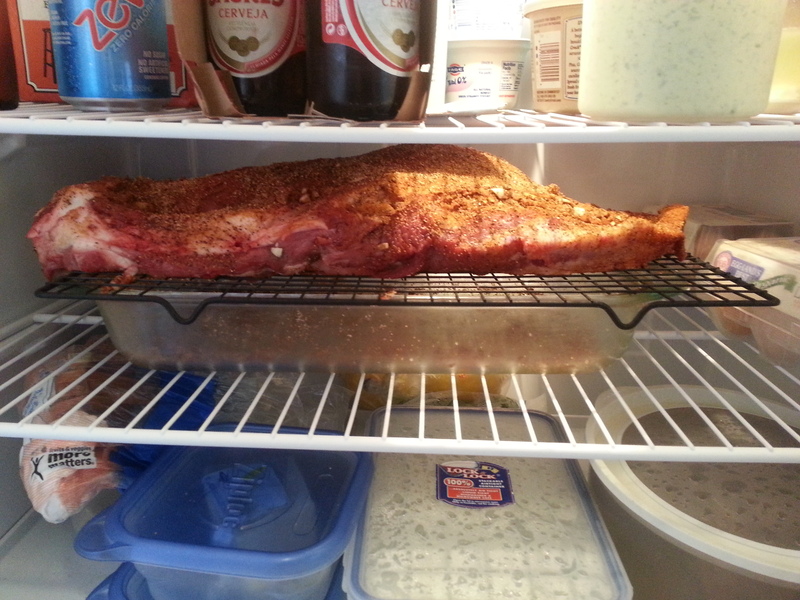 Rub in well, cover and let sit in fridge overnight. Try to keep the liquid around 1 1/2 – 2 cups for a brisket this size. 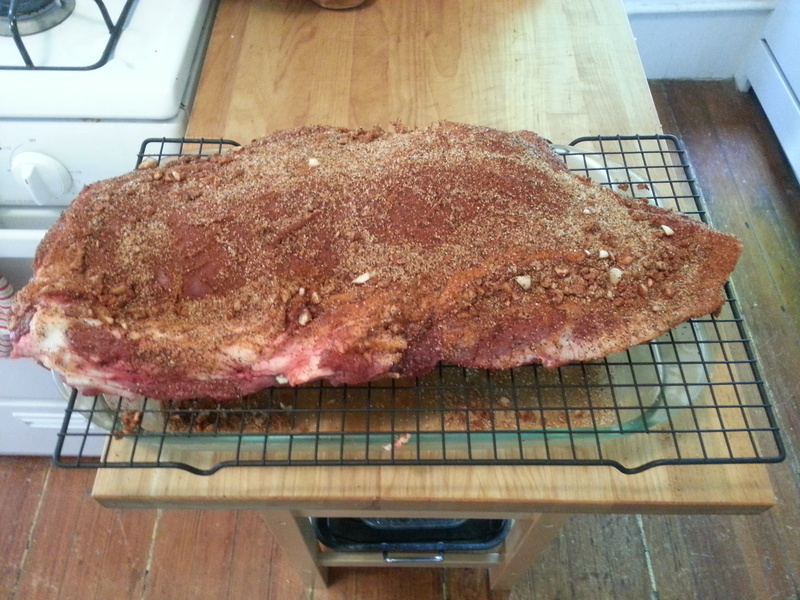 Cover the pan with foil and bake at 250F for 75 minutes per pound of brisket. Let the brisket rest in the pan for 15-30 minutes after it has cooked. If you want, reduce the pan sauce to a gravy and serve warm. Enjoy! This entry was posted in Meat, Uncategorized by Jeff. Bookmark the permalink.